I'm writing this with a huge lump in my throat as I've literally just finished The Martian by Andy Weir. This book was chosen by Charlotte and I was a little worried as she was almost certain no one would like it. Well she was right on that front because I didn't like it - I loved it! 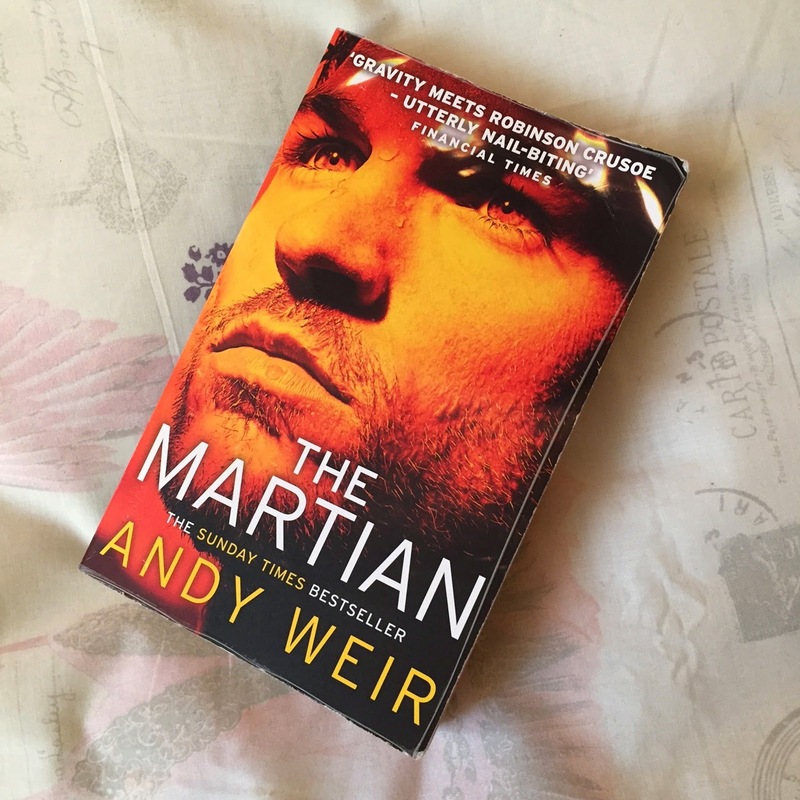 The book is about an astronaut called Mark Watney, and due to circumstances I won't go into (as it's a spoiler), he finds himself left by his crew and stranded on Mars. Mark initially thinks no one knows he's still alive so decides he needs to find ways to survive alone, and he is full of determination and wants to find his way back to earth. There is seemingly only one way to do this which is to wait for the next crew to Mars to rescue him......said crew would not arrive on Mars for 4 years! Now, this is a bit of a spoiler I'm afraid, but NASA do indeed find out that Watney is alive so it becomes a race against time to not only help Watney in his experiments to make and sustain food supplies, but also to expedite a Mars mission to get him home. It admittedly took me a few chapters to get into the book as the beginning is extremely technical with lots of scientific jargon, but there was something about the first person narration that kept me going. But once I was over that hump I was fully enthralled in this space adventure and I felt Andy Weir did a brilliant job in making the reader feel like they knew Mark and as a reader I was rooting for him every time he encountered a setback. Andy made Mark incredibly funny and I often found myself giggling throughout the book as Mark's wit and upbeat behaviour totally drew me in. I doubt I'll ever know what it's like to be stranded on Mars but I'll hazard a guess that I'd be ever so slightly hysterical waiting for death, but Andy kept Mark light with numerous jokes about bad sitcoms and Disco music via laptops left by his crew mates. It is heavy on the science which will fill all science geeks with joy, but what's so great about the book is that it's written so incredibly well and everything is talked through and explained so the non-scientist nerds like myself felt fully in the know. I was so engrossed in this story and although I won't tell you if he makes it or not, what I can tell you is that reaching the end will leave you feeling quite emotional - you'll have to read to find out if it's for the good or the bad! Don't forget to check out the reviews from my fellow Nerdsville crew - they'll be up soon! That looks like just my sort of book. On the strength of your review, I've just ordered a copy - thanks!